Update: Direct feed footage of Project Bluestreak can now be found below. Boss Key Productions, the new home for Cliff “Gears of War” Bleszinski’s Project Bluestreak showed off the first in-game footage at their panel at PAX East today. Our own Evan Lahti was in the audience with a cell phone and a rock-steady camera hand. In addition to sci-fi panels and a weapons locker filled with lethal hardware, we saw some samurai-inspired armor and a peaceful Japanese garden flanked by cherry blossoms. If one were prone to leaping to conclusions, one might guess that the game will be set in a futuristic Japanese environment. 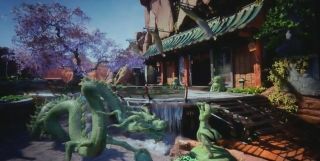 The game will also run on Unreal Engine 4, which powers the sleek lighting effects and flowing water features.